To Rogerio: You should have no problems running Shift at the highest graphics settings possible. Are you satisfied with its performance in Shift? You could try to do that benchmark like I did on London Royal Mile with same settings - of course you are going to run it in your native screen resolution - but I think you will see similar numbers. Anyway if you are seeing high fps even when recording with FRAPS - why not get all the eye candy now you paid a lot of money for being able to do so? About PhysX in Shift; Shift uses PhysX but only as software implemented and processing is done by the CPU. And why is that? Because you do not see lots of moving objects you can interact with and you do not see things moving other than a simple flag or banner - its is simply not needed to be done by the much more suited GPU. For Shift to have had hardware accelerated PhysX done by the GPU - they would have focused a lot more on such things, and I think they would then have had problems making this an all console and PC game, and left out lots of ATI owners who would not have gotten all the "good" stuff. To all: It is as I described possible to use a dedicated graphics card from Nvidia to do the PhysX computing and have an ATI card to the rendering. X-bit lab tried it out and used the same link as i posted earlier on to test in a very nice article for those interested and to those playing games that uses GPU PhysX. Very interesting article indeed. This link pops up with the page that describes how to do the "ATI render and Nvidia Physx solution" - but read the whole article. To Sunny: What do you think would happen if you added another 250GTS and ran in SLI? I know you have a 750W PSU now and you would have no problems doing it. I wonder if it would be much faster than my 285 GTX? I will have to see if i can find a graph that tells us whether that could be a good deal for you. To Tomas: You are in bad luck - Shift´s does not support multiGPU cards very good as you can see from this picture. I read something about someone using just one GPU on the card, turning the other off. I would still have 1 gb of memory..
Is it safe to rename the executable without messing up the game? This really sux, I paid alot of money for this PC. When I bought this it was worth over 4000 euro and it was the best parts I could find for everything, according to all tests and so on. Then the problem with mirrors edge, not being able to see the whole game, and now with shift. Ridiculous. Anyway, I didnt see any change in framerate after the new driver update. I did see a slightly higher framerate after turning off windowed mode in graphic settings, but turning off and on the rest doesnt make a difference or in some cases makes it worth, which sounds very much like a compatibility issue to me. Tomas why do you think PhysX has anything to do with your low fps in Shift? Because Shift´s PhysX is not done by the GPU - turning it off will have no effect. This has been shown in several threads I have read. It is a multi GPU problem Shift has - not a Physx problem related to using a multi GPU. Thanks a lot for the feedback guys! I will try to record something with fraps and will base my graphic settings from there! Tomas, if you can turn off one of the GPUs, do it... Its almost certain you will have more fps then, based on the info Poul found out. Well, I dont really care what it is exactly, I just want it to work. I tried to read some threads at different forums too, and many point to the physX-incompatibility. But I dont know, and if we really knew the problem would be fixed. What we do know is that shift wont even start without physx installed, which is suspicious since not everyone will use nVidia cards. If EA were neutral they would implement a function to turn physx off in the game, optimizing it for ATI-users, like in mirrors edge. If SMS or EA or who ever writes the contracts between the companies behind these different graphic engines and so on choose to go with a product from nVidia, it's likely that it lies in their interest to make the game customers go with their cards and make money for them. Thats not some conspiracy theories, just how the free market works. Thats why I am suspicious of something built in not to work great on ATI-cards. I tried using only one GPU, and it made no difference in framerate. That Rogerio is getting higher framerate says that I perhaps could do something to get a little higher too. I'm almost up to 70 fps now though with windowed mode off and vsync off. It's good enough for playing the game, but with fraps on it could still be a problem, even recording in half size and 25 fps. The point is ,this PhysX not running on your PC doesnt make Shift slower, the game detects your hardware.If PhysX affected the system ,Rogerio's HD5850 would be definitly a lot slower. Tomas I just read this at EA Shift forum and this Yoga guy seem to know what he is talking about. I never read everything in those threads at Shift forum about ATI owners having problems, but i know there was a lot of posting back then. I really have no idea what could be your problem here since i do not know what things (hardware) and programs you are using in the background while running Shift. Why not ask for support at EA or ATI? This link contains more than 50 pages of people complaining about their problems with Shift and ATI cards. You will have to do a lot of reading I am afraid., but perhaps you all ready read them all? I, like Aaron, uninstalled Physx and we can run the game without problems... In both cases we had Nvidia Cards and changed to ATI ones... And didnt re-installed the OS. I uninstalled it and the game gave a message like "couldnt start game because the file physx-something couldnt be found". I installed it from nvidia site, the latest version, which didnt fix the problem. I uninstalled the physx again and installed physx from the physx folder on the nfs shift dvd, then it worked as before. It this is possible for you and Aaron, perhaps that points to that I have physx enabled in some way, somewhere, which could be a problem, thus making it impossible for me to start the game without it installed.. just speculating here. It's a very long thread, I actually read it all. It offers some suggestion to fixes here and there, but it's mostly repetetive complaining and speculating. It's mostly the suggestions that was mentioned here, installing the latest drivers, using only one gpu, turning off physx. However none of these things helped me at all. The only thing that helped me somewhat was running the game in full screen not windowed mode. I dont know why this worked for fps, but I dont want to run it like that because I risk the game crashing by switching back and forth from different windows while the game's running. It's specifically prone to that if I accidentally switch out during loading times, before races and so on. I think I will contact ATI and EA-tech support about it. You seem to know some stuff about analyzing hardware and so on. What is in your opinion the logical way of analyzing the problem? Any programs that tests my performance and speed, reads conflicts and suggests solutions? Other than that I really have no idea what causes all the multigpu´s to perform so badly in Shift. But I will bet that either ATI or EA will know, since you are not the first to have this problem. You sure about it being PhysX and not DirectX that error message said? I do not think the game requires Physx enabled I think, since you can turn it off in Nvidia control panel - but not sure about that. I will keep searching the net for a solution to your problem, but with all the people having this - I am surprised the patch did not fix this. I forgot. You are seing high fps in other games and it is only in Shift you are having problems Tomas - right? I renamed the executable, no difference in fps. But that was for micro stuttering (?) .. dont believe I've seen any of that. The framerate is the issue. 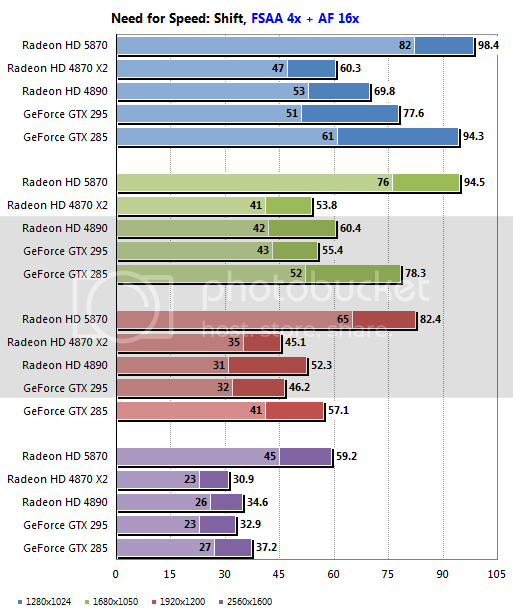 And not really such a problem as for the guys seeing down to 25 fps or lower. It's actually fully playable since I changed the fullscreen not windowed mode. But as you mention, my rig should show different framerates, and that bothers me still. Perhaps install more nvidia stuff so I get the control panel you showed? I couldnt find anything like that, only the driver installed. Then I could manually disable it there, forcing it to be utilized by the cpu instead as mentioned... although it feels kinda wacky to start installing incompatible stuff. And again.. how come I couldnt start the game without physx when both Rogerio and Aaron uninstalled it succesfully? Thats wierd. I'm not really much of a gamer like that, but the games I've tried like the demanding mirrors edge I had very good framerates when physx was turned off in the game. Btw.. when I am in the menus, and in different places outside actual playing on track, sometimes the framerate goes up to 1400 fps, stays there, when it comes back to the fully loaded menu, it's about 60 fps the whole time. While starting the game, showing the videos the framerate is also very high, but then it goes down and is at it's lowest while racing. I will email EA and AMD about it and ask for suggestions. But if those guys really had a fix for it, since there are so many with this problem they can't have missed that, I think it would be mentioned by the release of ATI's last driver update, or EA would have a sticky in the forum with a solution to it. When I start Shift with FRAPS on I see fps going up to 3600 and in menu when I mess around it shows 150 fps. I will try to help you out here, but try asking at ATI and EA and more important start a new thread at ATI forum about your problem. People such places are always willing to help out.